Some days you get wacky press releases, but not everyday do you get ones as wacky as this. Turn your iPhone on yourself, says author Greg Dawe, and let it look into the void within. In something that sounds like script notes for the film Inception, he suggests we use our iPhones to read our own minds. And it’s not the plot of his new book, he’s describing a new gadget – the Epcoc brain reader from Emotiv.com. 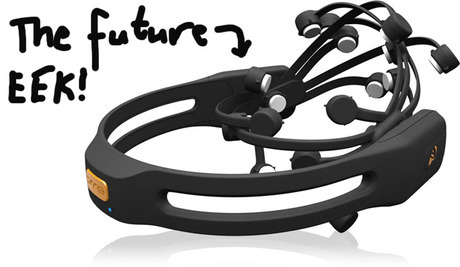 From what I can figure out sci-fi writer Greg Dawes has been prophesying the advance of mind-reading headgear since 1992, and now it has arrived in the form of the Emotiv headset (sort of) he is telling us what this brave new world will be like.. The iPhone gets involved because it is one of several devices you can plug the Emotiv headset into. The Emotiv Epoc works like devices used in medicince to detect electrical impluses in the brain, using electrodes on the surface of your head to detect brain waves. In hospitals, that data would be used for medical reasons, with the Epoc, it would be used to control computer games for example. “Neurofeedback is a technology which allows a person to monitor their own brainwaves. Armed with this knowledge the user is then able to consciously intrude into the feedback loop and make adjustments. Stressed out with a head full of buzzing, logical beta? Try a shot of theta. Too much dreamy alpha? Up your beta waves. Once you’ve got the hang of it – once the brain begins to wake up to itself – the idea is to create a symphony of brainwaves which gives you that feeling when everything makes perfect, crystal clear sense; in other words, a state of complete freedom and infinite possibilities. Which sounds great. So why isn’t everyone doing it?